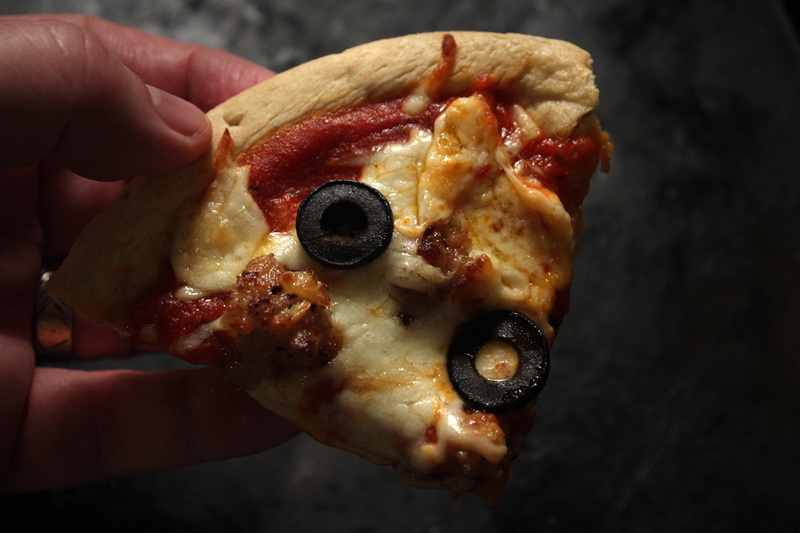 Hallelujah it's National Pizza Day! Heck, every day should be National Pizza Day. 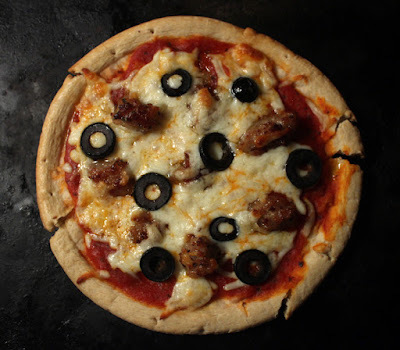 Check out my pizza celebration below with quick and easy Pizza recipes and a couple reviews of frozen Pizzas -- go ahead, dig in! 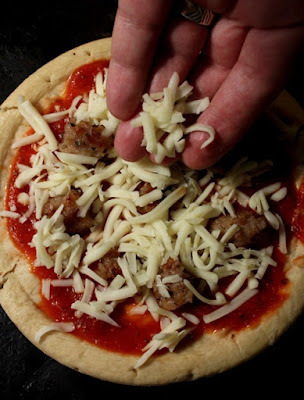 You could use fresh pizza dough from the deli case too, just back time it, that is, if it takes 20 minutes to cook the dough, then top the pizza with an egg during the last 10 minutes of baking. 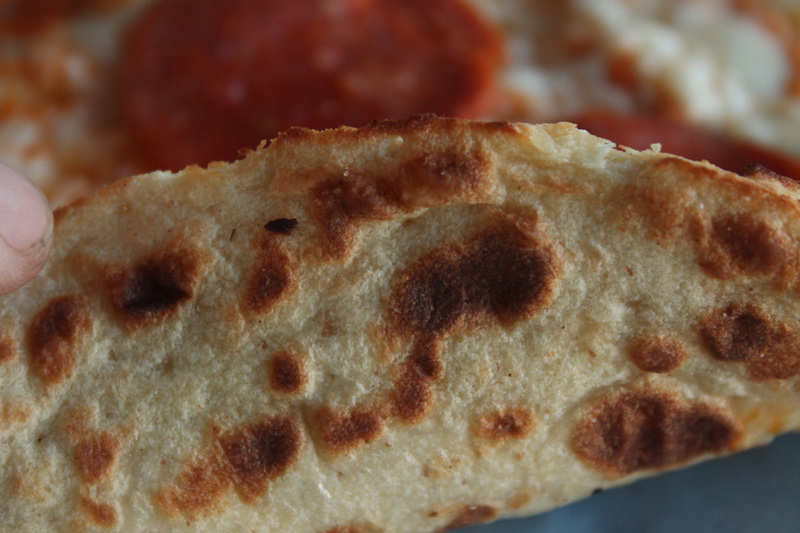 If you can't find individual pizza crusts then slice a whole pizza crust to the size you like and work with that. It's easy enough to use the other half later, that is if you can stand the wait. 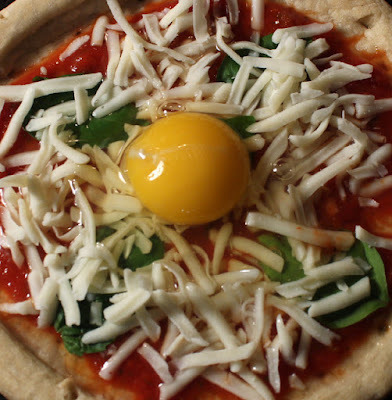 Or make a whole regular size pizza and add 2 or 3 eggs on the toppings. You can make a traditional pizza too with this pre-cooked pizza crust. How about a Black Olive and Sausage Pizza? All the ingredients are super cheap of course, everything from a can of olives to ground breakfast pork. While breakfast pork is not Italian, you can make it pretty close by mixing in a teaspoon of dried Italian herbs, again easily found at Dollar Tree or the 99c only Stores. I use a pre-cooked crust, so the baking time is only about 10 minutes at 400 degrees, just enough tome to heat all the ingredients and melt the cheese -- that's it! 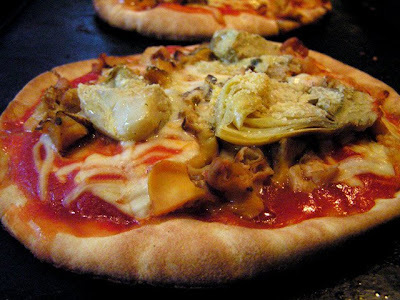 My first seafood-topped pizza was from a small side-street restaurant during a Rome, Italy vacation. Some may blanch when served calamari, clams and shrimp on a pizza, but how can you resist when it's paired with melted mozzarella and artichoke hearts? 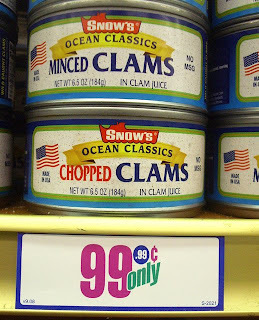 I simplify things by using a 99.99 cent can of chopped clams. 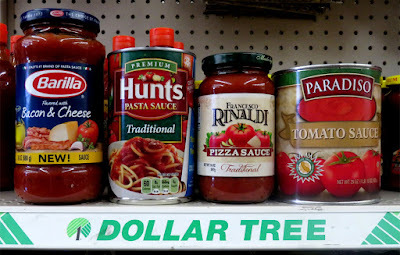 One can is enough for three small individual pita pizzas; all other ingredients are often found in local 99c only Stores, including pita bread (although regular local markets often have sales on canned minced clams and shredded mozzarella. 1 small jar of marinated artichoke hearts (6oz.) in oil or water, drained. Time for a couple Pizza Deal of the Day reviews. 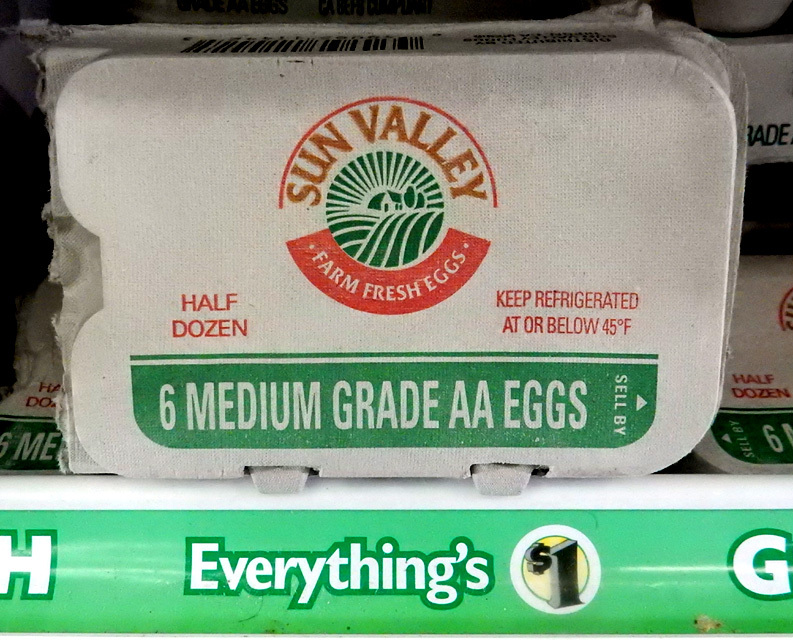 Many are adequate, and some are even quite tasty, that is if you sprinkle on some extra mozzarella! 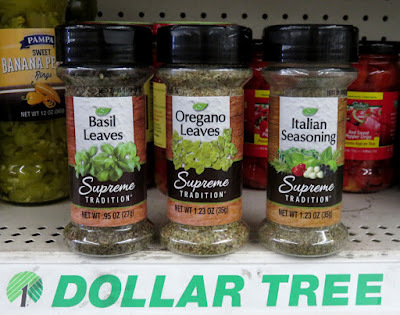 Unfortunately this Deal of the Day is bleh. I mean it's not bad, just mediocre. And that goes for both Atkins Stone Fired Pepperoni and Cheese Pizza. 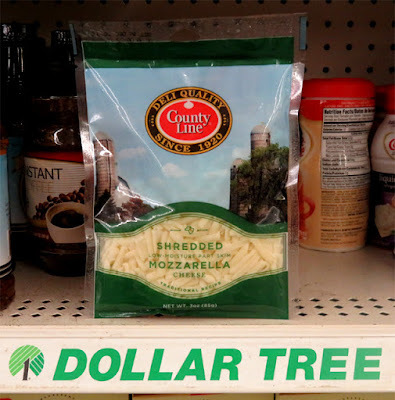 I know it's hard to find a tasty frozen pizza for a buck. One day I'll find what I'm looking for, just not yet. 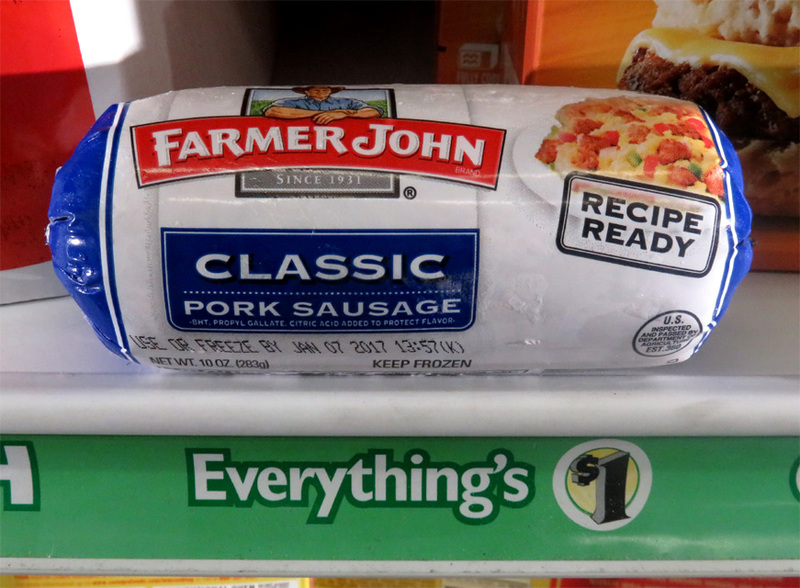 In general I like Atkins frozen meals that show up in my local 99c only Store's frozen case, like this one a click away, here. I first tried the Stone Fired Pepperoni Pizza. 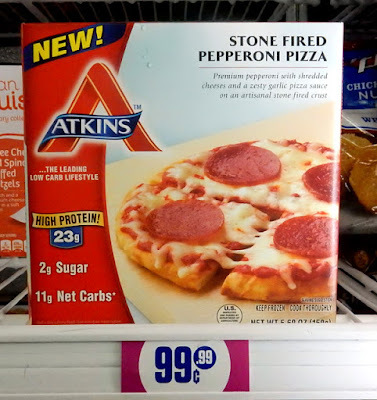 This one had 3 slices of pepperoni, not four slices shown on the box cover - better supervision is needed at the Atkins pizza plant. 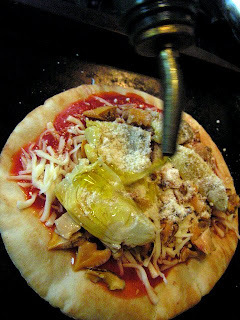 The main problem was the lack of tomato sauce and the lack of cheese. I guess to keep the price down they cut the cheese when adding pepperoni. 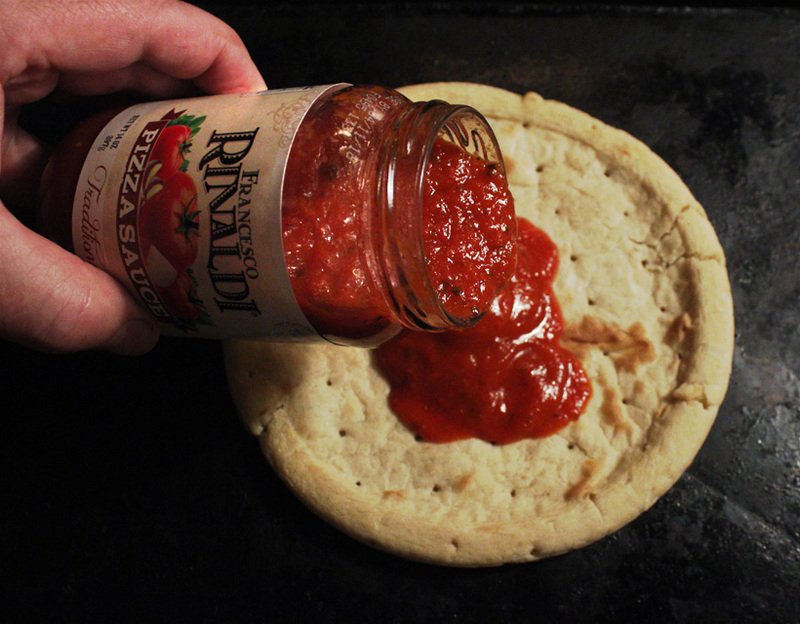 I don't need a lot of tomato sauce, but this single serving had the tiniest smear. 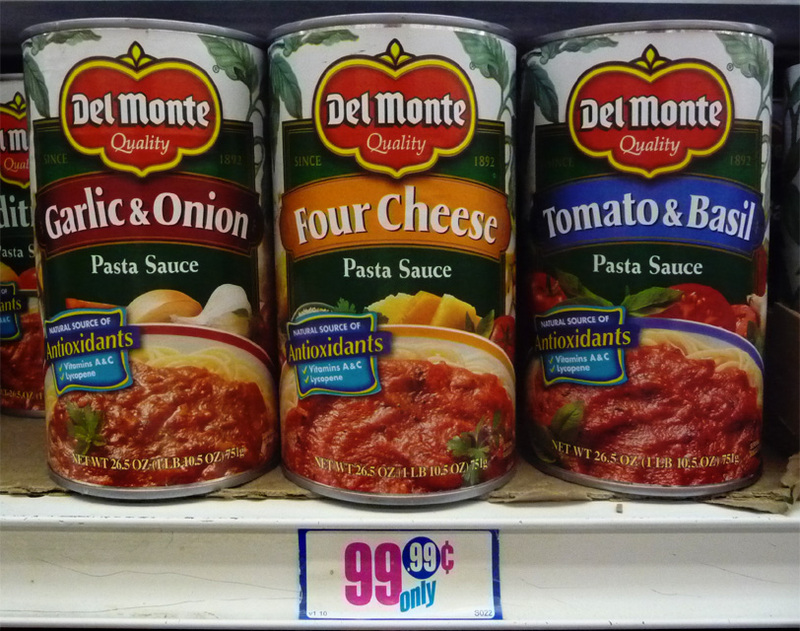 You would think since cans of tomato sauce are so cheap that they would ladle it on. 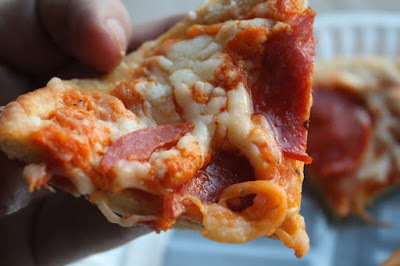 I thought the pepperoni slices were fine. Thin but spicy and pungent just like pepperoni should be. 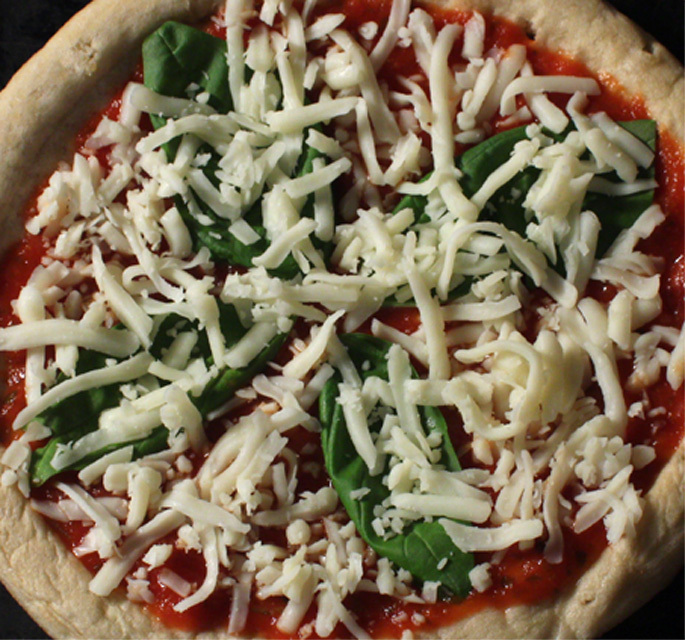 And the cheese was flavorful with mozzarella and parmesan. Like I said earlier, it could have used more. And finally the pizza crust is medium thick and blistered. 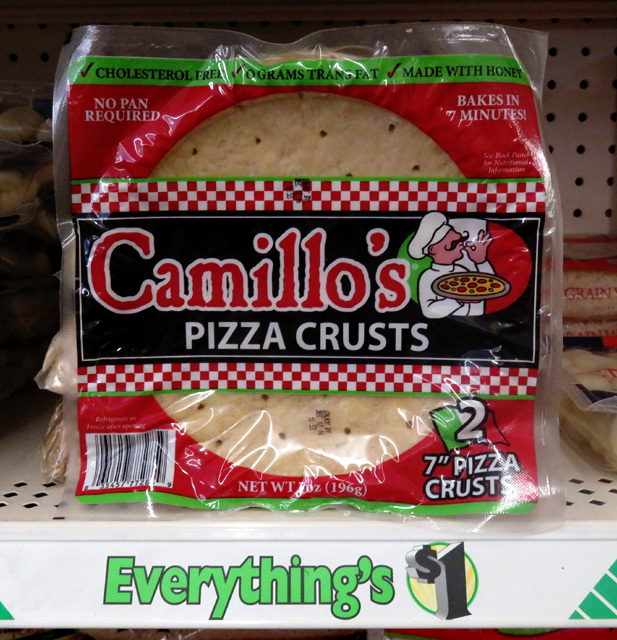 I prefer thin, but the dough is tasty enough -- Chicago and New York-style crusts have nothing to worry about here. So on the 99 Cent Chef's Cheap$kate Dining Scale of 1 to 9, 9 being best, I give Atkins Stone Fired Pepperoni Pizza a 4! So on to the next Deal of the Day, Atkins Stone Fired Cheese Pizza. Now this is more like it. This pizza has plenty of melty, gooey cheese, just the way I like it! It still has too little sauce, but the cheese amount almost makes up for it. While not the most flavorful mozzarella and parmesan, it's fine. I think an extra shaving or two of parmesan cheese would do the trick. 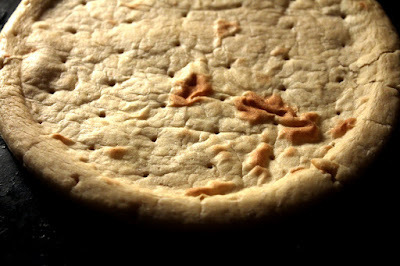 And it has the same crust. 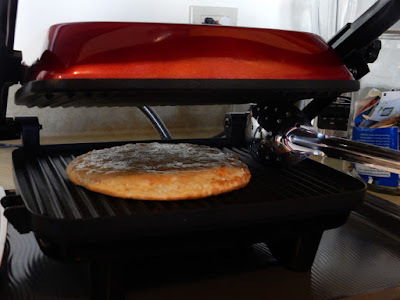 I tried frying this frozen pizza on a George Forman-like grill for a better crust, but due to the thick dough it still did not crisp up enough, before the cheese started melting all over the place, and the too little tomato sauce almost evaporated away. The ingredient list is too long for both pizzas, but that could be preservatives in the pepperoni and cheeses. 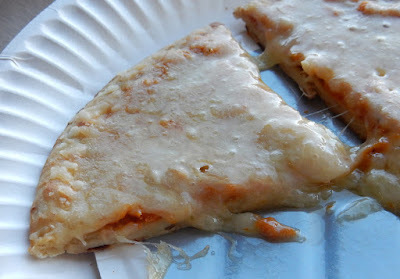 So on the 99 Cent Chef's Cheap$kate Dining Scale of 1 to 9, 9 being best, I give Atkins Stone Fired Cheese Pizza a 6 ! It's a little better than bleh. 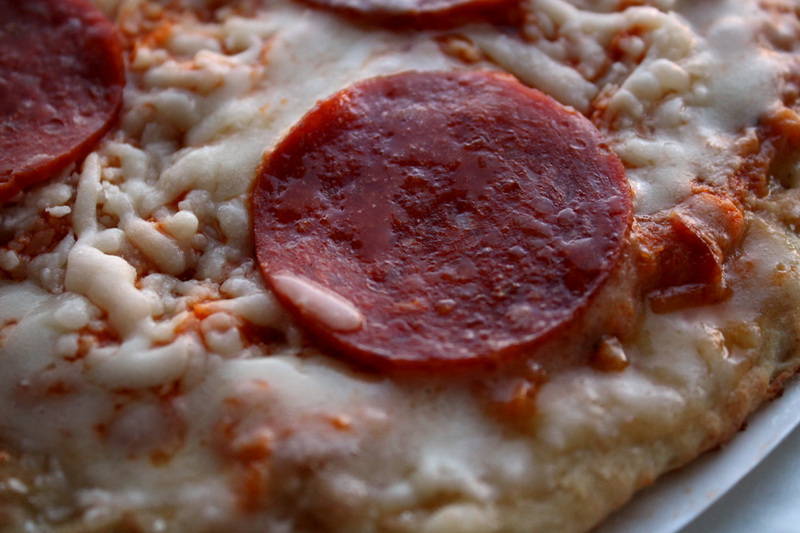 While I shouldn't complain too much for single serving pizzas for a buck, I would recommend the Cheese Pizza over the Pepperoni. 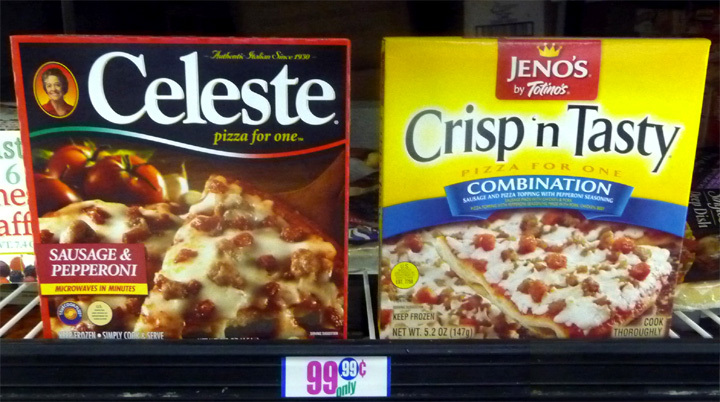 Welcome to the real Hunger Games, with a battle royale between 2 pizza purveyors, Geno's and Celeste. 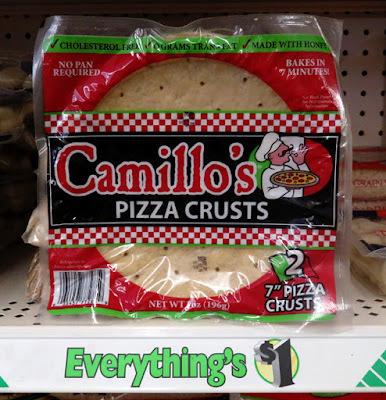 In my latest Deal of the Day it's mini pizzas going mano-a-mano and the winner gets the Chintzy Award for Best Cheap Pie. This is cuisine made for dorm room keg parties and minimum wage workday lunches. I picked up each single serving pie from the frozen deli case at this 99c only Store for 99.99 cents (or $1.) The pizzas are the perfect size for lunchtime appetites. I got the same toppings of cheese, pepperoni and sausage on both. 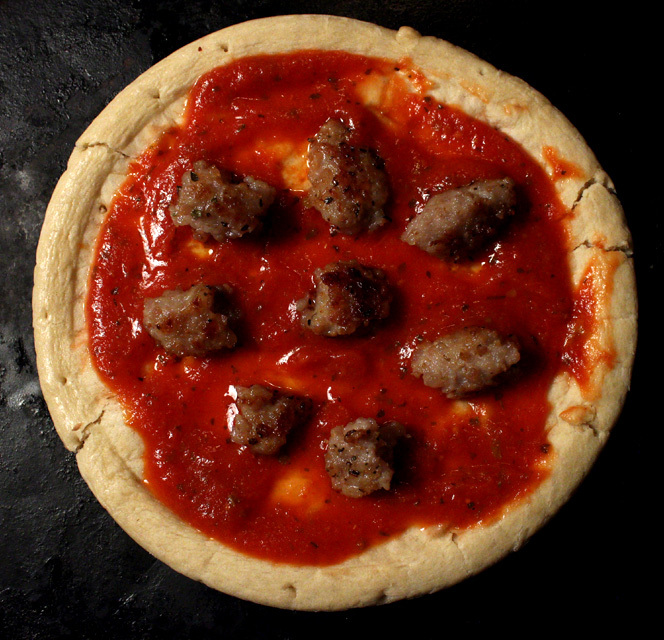 Normally I like a pizza hot from the oven, but for this meal showdown, I am going with the quicker microwave preparation. -- following the box directions. 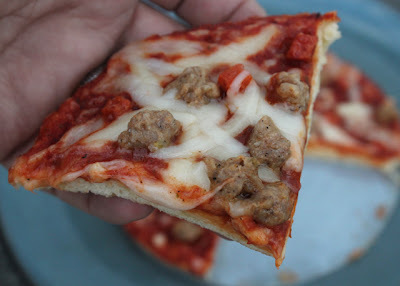 There is more tomato sauce and chunkier meat topping -- so you can really taste the Italian sausage and pepperoni. -- Celeste is a winner in the meat category. 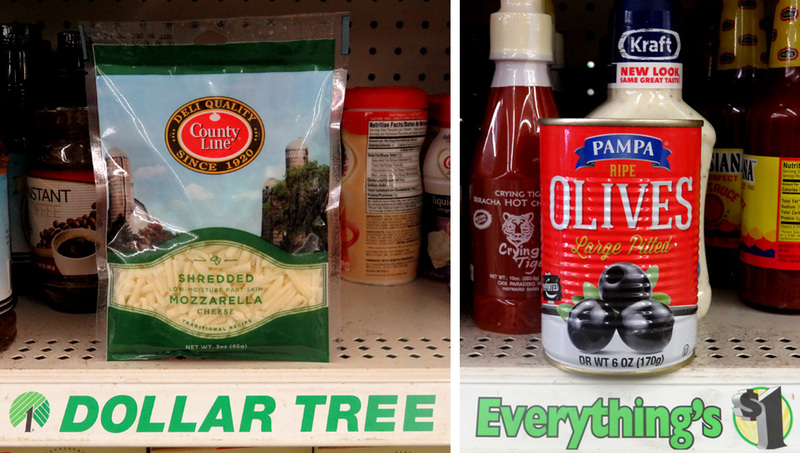 Also, larger lashings of mozzarella cheese make individual bites varied, as ingredients are larger but spread out more. And the tomato sauce, while plain, binds all the flavors together. There is a silver crisping plate included. 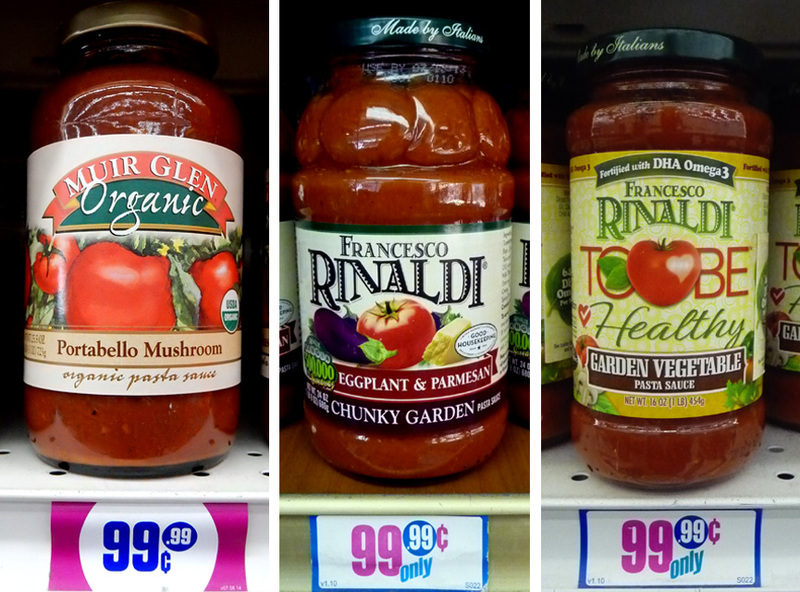 Italian herbs shine through in the tomato sauce. 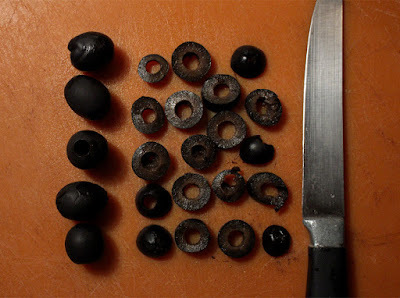 But the meat toppings are hard to discern, due to the small sizes. 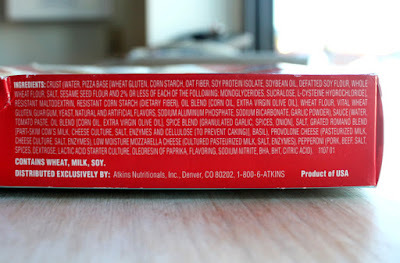 While Jeno's has a uniform flavor profile as all the parts are almost blended together in a pleasing way. Funny, but Jeno's did not have a silver microwave crisper, so I used Celeste's. I'm sure both single serving pizza would benefit from oven baking, but at my job (and most dorm rooms) there is only a microwave oven. So this is a test in real-world conditions. In both cases, the crust is a little mushy as expected, but they share a pleasing yeasty dough flavor. Both pies are the same size and thickness. 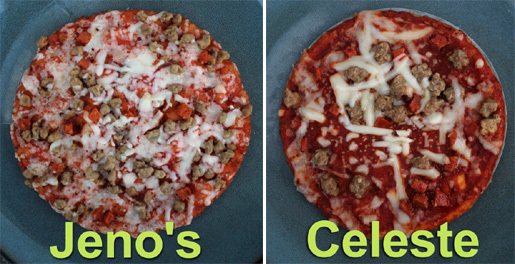 Jeno's looks like it has more toppings, but looks are deceiving. So on a scale of 1 to 9, 9 being best, I give the Chintzy Award to Celeste, with a 6 rating. I preferred the chunkier sausage topping and larger treads of cheese. 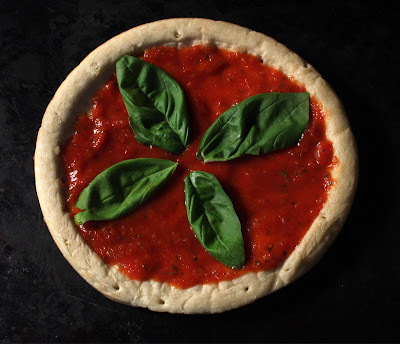 I also liked the simple tomato sauce flavor. 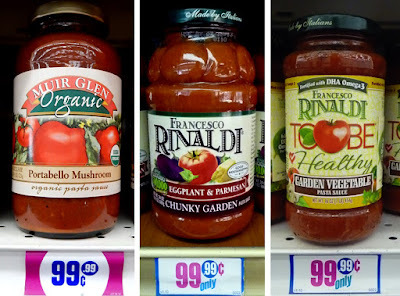 While Jeno's is the loser, I give them higher marks for a more intense overall Italian herb flavor. 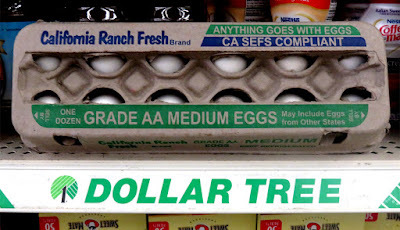 And I would buy both again for a cheapie lunch. 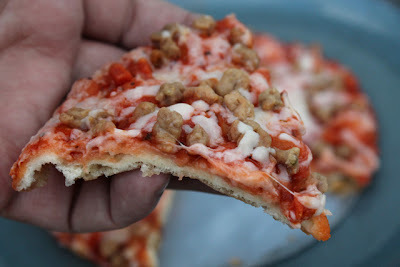 But I am always on the lookout for a better single serving chintzy pizza. If you know of one, then do leave a comment about it and I'll look for it.